Trends PW-10發燒變壓器電源,全機採用發燒級零件,買一套即可同時供電+12V, +5V及+24V三組音響設備. 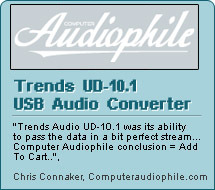 想將Trends Audio的音響產品表現,推至最高的境界, Trends PW-10發燒變壓器電源是必然之選! 一個交流電源輸入可同時支持+12V, +5V及+24V三組音響器件: 例如: Trends TA-10, Trends PA-10和Trends UD-10. It is a steady, regulated, 12V DC and 4A(48W) power supply with high current supply designed to power TA-10 device. 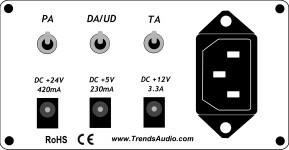 It is a steady, regulated, 12V DC and 3A(36W) power supply with high current supply designed to power TA-10 device. This high quality 24V AC adaptor is useful for many applications and tailor-made for PA-10. 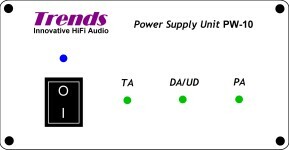 This external power is for Trends UD-10 USB Audio Converter and it provides a better sound from the computer audio. It effectively isolated the serious interference from within the PC/Mac case. e.g. the high frequency data signals, the switching-mode power supply and the FAN motors, etc? Whether you have an existing external DAC or an AV receiver with an open digital input, the Trends Audio UD-10 with Battery Pack can bridge the gap between your computer and the rest of your system.